Azure Cosmos DB is a fast and flexible distributed database that scales seamlessly with guaranteed latency and throughput. You do not have to make major architecture changes or write complex code to scale your database with Azure Cosmos DB. Scaling up and down is as easy as making a single API call. To learn more, see how to provision container throughput or how to provision database throughput. However, because Azure Cosmos DB is accessed via network calls there are client-side optimizations you can make to achieve peak performance when using the SQL .NET SDK. Gateway Mode is supported on all SDK platforms and is the configured default. If your application runs within a corporate network with strict firewall restrictions, Gateway Mode is the best choice since it uses the standard HTTPS port and a single endpoint. The performance tradeoff, however, is that Gateway Mode involves an additional network hop every time data is read or written to Azure Cosmos DB. Because of this, Direct Mode offers better performance due to fewer network hops. Gateway connection mode is also recommended when you run applications in environments with limited number of socket connections, for example when using Azure Functions or if you are on a consumption plan. 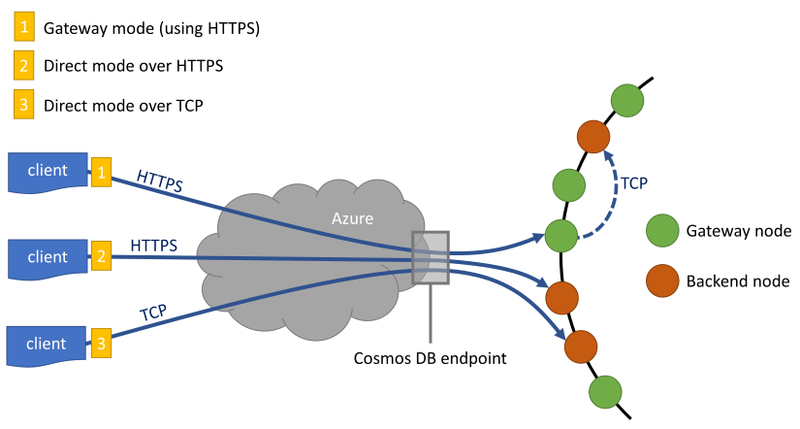 Azure Cosmos DB offers a simple and open RESTful programming model over HTTPS. Additionally, it offers an efficient TCP protocol, which is also RESTful in its communication model and is available through the .NET client SDK. Both Direct TCP and HTTPS use SSL for initial authentication and encrypting traffic. For best performance, use the TCP protocol when possible. The Connectivity Mode is configured during the construction of the DocumentClient instance with the ConnectionPolicy parameter. If Direct Mode is used, the Protocol can also be set within the ConnectionPolicy parameter. Because TCP is only supported in Direct Mode, if Gateway Mode is used, then the HTTPS protocol is always used to communicate with the Gateway and the Protocol value in the ConnectionPolicy is ignored. By default, the first request has a higher latency because it has to fetch the address routing table. To avoid this startup latency on the first request, you should call OpenAsync() once during initialization as follows. 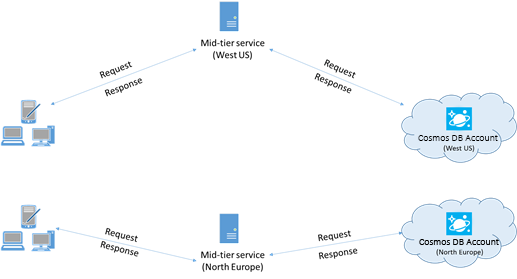 Since calls to Azure Cosmos DB are made over the network, you may need to vary the degree of parallelism of your requests so that the client application spends very little time waiting between requests. For example, if you're using .NET's Task Parallel Library, create in the order of 100s of Tasks reading or writing to Azure Cosmos DB. In order to reduce latency and CPU jitter, we recommend that the client virtual machines are accelerated networking enabled. See the Create a Windows virtual machine with Accelerated Networking or Create a Linux virtual machine with Accelerated Networking articles to enable accelerated networking. Each DocumentClient instance is thread-safe and performs efficient connection management and address caching when operating in Direct Mode. To allow efficient connection management and better performance by DocumentClient, it is recommended to use a single instance of DocumentClient per AppDomain for the lifetime of the application. Azure Cosmos DB requests are made over HTTPS/REST when using Gateway mode, and are subjected to the default connection limit per hostname or IP address. You may need to set the MaxConnections to a higher value (100-1000) so that the client library can utilize multiple simultaneous connections to Azure Cosmos DB. In the .NET SDK 1.8.0 and above, the default value for ServicePointManager.DefaultConnectionLimit is 50 and to change the value, you can set the Documents.Client.ConnectionPolicy.MaxConnectionLimit to a higher value. SQL .NET SDK version 1.9.0 and above support parallel queries, which enable you to query a partitioned collection in parallel. For more information, see code samples related to working with the SDKs. Parallel queries are designed to improve query latency and throughput over their serial counterpart. Parallel queries provide two parameters that users can tune to custom-fit their requirements, (a) MaxDegreeOfParallelism: to control the maximum number of partitions then can be queried in parallel, and (b) MaxBufferedItemCount: to control the number of pre-fetched results. (a) Tuning MaxDegreeOfParallelism: Parallel query works by querying multiple partitions in parallel. However, data from an individual partitioned collect is fetched serially with respect to the query. So, setting the MaxDegreeOfParallelism to the number of partitions has the maximum chance of achieving the most performant query, provided all other system conditions remain the same. If you don't know the number of partitions, you can set the MaxDegreeOfParallelism to a high number, and the system chooses the minimum (number of partitions, user provided input) as the MaxDegreeOfParallelism. (b) Tuning MaxBufferedItemCount: Parallel query is designed to pre-fetch results while the current batch of results is being processed by the client. The pre-fetching helps in overall latency improvement of a query. MaxBufferedItemCount is the parameter to limit the number of pre-fetched results. Setting MaxBufferedItemCount to the expected number of results returned (or a higher number) allows the query to receive maximum benefit from pre-fetching. Reducing the frequency of garbage collection may help in some cases. In .NET, set gcServer to true. During performance testing, you should increase load until a small rate of requests get throttled. If throttled, the client application should backoff on throttle for the server-specified retry interval. Respecting the backoff ensures that you spend minimal amount of time waiting between retries. Retry policy support is included in Version 1.8.0 and above of the SQL .NET and Java, version 1.9.0 and above of the Node.js and Python, and all supported versions of the .NET Core SDKs. For more information, RetryAfter. With version 1.19 and later of the .NET SDK, there is a mechanism to log additional diagnostic information and troubleshoot latency issues as shown in the following sample. You can log the diagnostic string for requests that have a higher read latency. The captured diagnostic string will help you understand the number of times you observed 429s for a given request. Cache document URIs whenever possible for the best read performance. You have to define logic to cache the resourceid when you create the resource. Resourceid based lookups are faster than name based lookups, so caching these values improves the performance. When performing a bulk read of documents using read feed functionality (for example, ReadDocumentFeedAsync) or when issuing a SQL query, the results are returned in a segmented fashion if the result set is too large. By default, results are returned in chunks of 100 items or 1 MB, whichever limit is hit first. To reduce the number of network round trips required to retrieve all applicable results, you can increase the page size using x-ms-max-item-count request header to up to 1000. In cases where you need to display only a few results, for example, if your user interface or application API returns only 10 results a time, you can also decrease the page size to 10 to reduce the throughput consumed for reads and queries. See Increase number of threads/tasks in the Networking section. For Executable applications, this can be done by unchecking the Prefer 32-bit option in the Project Properties window, on the Build tab. For VSTest based test projects, this can be done by selecting Test->Test Settings->Default Processor Architecture as X64, from the Visual Studio Test menu option. For locally deployed ASP.NET Web applications, this can be done by checking the Use the 64-bit version of IIS Express for web sites and projects, under Tools->Options->Projects and Solutions->Web Projects. For ASP.NET Web applications deployed on Azure, this can be done by choosing the Platform as 64-bit in the Application Settings on the Azure portal. Cosmos DB’s indexing policy also allows you to specify which document paths to include or exclude from indexing by leveraging Indexing Paths (IndexingPolicy.IncludedPaths and IndexingPolicy.ExcludedPaths). The use of indexing paths can offer improved write performance and lower index storage for scenarios in which the query patterns are known beforehand, as indexing costs are directly correlated to the number of unique paths indexed. For example, the following code shows how to exclude an entire section of the documents (a.k.a. a subtree) from indexing using the "*" wildcard. To measure the overhead of any operation (create, update, or delete), inspect the x-ms-request-charge header (or the equivalent RequestCharge property in ResourceResponse or FeedResponse in the .NET SDK) to measure the number of request units consumed by these operations. The request charge returned in this header is a fraction of your provisioned throughput (i.e., 2000 RUs / second). For example, if the preceding query returns 1000 1KB-documents, the cost of the operation is 1000. As such, within one second, the server honors only two such requests before rate limiting subsequent requests. For more information, see Request units and the request unit calculator. If you have more than one client cumulatively operating consistently above the request rate, the default retry count currently set to 9 internally by the client may not suffice; in this case, the client throws a DocumentClientException with status code 429 to the application. The default retry count can be changed by setting the RetryOptions on the ConnectionPolicy instance. By default, the DocumentClientException with status code 429 is returned after a cumulative wait time of 30 seconds if the request continues to operate above the request rate. This occurs even when the current retry count is less than the max retry count, be it the default of 9 or a user-defined value. The request charge (i.e. request processing cost) of a given operation is directly correlated to the size of the document. Operations on large documents cost more than operations for small documents. For a sample application used to evaluate Azure Cosmos DB for high-performance scenarios on a few client machines, see Performance and scale testing with Azure Cosmos DB. Also, to learn more about designing your application for scale and high performance, see Partitioning and scaling in Azure Cosmos DB.